The Hoo Peninsula is a peninsula in Kent, England (United Kingdom) separating the estuaries of the rivers Thames and Medway. It is dominated by a line of sand and clay hills, surrounded by an extensive area of marshland composed of alluvial silt. The name Hoo is the Old English word for spur of land. The Romans have been credited with the first two attempts at building a sea wall. The subsequent draining of the marshes created pastureland to support sheep. The area is rich in archaeology. Bronze Age implements and Jutish cemeteries have been found on the peninsula, and Roman pottery at Cooling. It was once the point of departure across the ancient Saxon fording point over the River Thames to Essex. Much of the peninsula lies in one of the Saxon divisions of England called "hundreds": here it is the "Hundred of Hoo". To be precise, the Hundred comprised the parishes and churches of Hoo St Werburgh, High Halstow, St Mary's Hoo, Allhallows and part of Stoke. The Isle of Grain, then a complete island, was in the Hundred of Gillingham; the remainder of the parish of Stoke was in the Hundred of Shamel. William the Conqueror granted his half-brother, Odo, the large estate of Hoo. During the First World War this peninsula was the site of an explosives factory and storage facility. The Peninsula's marshlands are part of the North Kent Marshes and now form a major part of two protected areas: the Thames Estuary and Marshlands, and the Medway Estuary and Marshes. 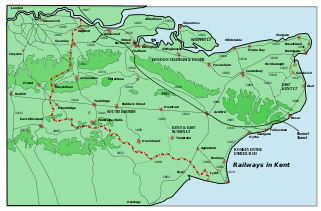 The Thames Estuary area covers the 15 miles (24 km) from Gravesend to the Isle of Grain; the Medway Area 15 miles (24 km) from Rochester to the Isle of Grain: a total of 38 square miles (98 km²) of marshlands. Both are Sites of Special Scientific Interest (SSSI) and Special Protected Areas (SPA). They include coastal grazing marsh, intertidal mudflats, saltmarsh and lagoons. On the line of hills lies the Northwood Hill National Nature Reserve. The Rivers Thames and Medway were joined by the eight-mile long Thames & Medway Canal, the construction of which started in 1805. With basins providing ports and access to the two rivers at Gravesend and Strood, the canal passed through a two-mile tunnel at Higham, broken in the centre by a shaft to allow boats to pass. Construction was difficult and expensive and it was not completed until 1824. Shortly afterwards, the tunnel became part of the railway linking Higham with Strood. The line of this now-silted canal can be considered a convenient boundary marking the landward edge of the peninsula. Engineers and surveyors, both governmental and private, undertook the consultation and subsequent construction of the recently introduced Medway Towns bypass, which drove a link route directly over the tunnel, causing geological instability. New housing built along the line of that route has further affected its stability. As a result, the tunnel was closed to trains for the duration of 2004 for relining but it has now reopened. The only main road is the A228, which crosses the old Roman London Road (also called Watling Street, now the A2) at Strood and then follows the high ground eastwards. It meets the Medway Towns Northern Bypass (A289) at the bottom of Four Elms Hill and climbs to Chattenden, bypassing Hoo St Werburgh and High Halstow, before crossing to the Isle of Grain. On the Peninsula this road is known as the 'Ratcliffe Highway'. The other principal route on the peninsula, the B2000, heads north to Cliffe on the edge of Cliffe marshes, part of the North Kent Marshes. This is a winding country road, much used by industrial transport serving the larger farms, including Mockbeggar Farm, and the industrial jetties onto the River Thames. The B2000 passes through Cliffe Woods under the name of 'Town Road', and enters Cliffe, where it becomes first 'Station Road', from the location of the now vanished station of the Hundred of Hoo railway, and then 'Church Street'. At the northern edge of the village the road becomes 'Pond Hill' and leads down the cliff to an unmetalled track on the marshes. The B2000 is rural in nature with several interesting old buildings along its route. There remains a Grade II listed red brick farmhouse dating from the 17th century 'Mockbeggar Farm'  and its barn, 25 yards (25 m) south of the farmhouse, and a Grade II building 'Mortimer's Farm House, Cliffe'. Another Grade II-listed farmhouse is Fenn Street Farmhouse, timber-framed and medieval in origin, with parts dated to the 15th century. Its age may be judged by the fact that in 1760 the building was refaced. There are numerous other minor roads on the higher ground, and a number of roads and trackways across the marshes, some of which eventually reach the sea walls. Hundred of Hoo Railway, shown with other railway lines in Kent. A poster of the opening of the Allhallows-on-Sea branch. The first part of the line to be opened was in March 1882, from Cliffe to Sharnal Street. This was later extended east to the Isle of Grain. Sharnal Street was the larger of the two original stations and was provided with goods sidings, where the local farmers were able to load their produce to be transported directly to the London markets. It was also at Sharnal Street that telegram and mail collections were effected. The peninsula is home to many land-hungry industries, including three power stations (Grain, Kingsnorth and Damhead Creek), a gas import plant and a container terminal. Most of these are on the Isle of Grain, but Kingsnorth lies on the south edge of the peninsula, up the River Medway from Grain. It opened in 1967 and burns coal or oil according to the economics of each. As with others in this area, the site has proved challenging. During building the reclaimed marshland was found to have poor load-bearing properties. Kingsnorth's ground level was some four feet below the highest tide even then, and tide levels are expected to rise another three feet in coming years. For the planners, these disadvantages were outweighed by the proximity to London, the availability of cooling water from the River Medway, and deep-water berthing for oil tankers and colliers. ↑ Arnold, Ralph (1974). The Hundred of Hoo. ASIN B0007J0HUC. 1 2 "Mockbeggar, Higham". www.britishlistedbuildings.co.uk. Retrieved 26 November 2013. ↑ "Mortimer's Farm House, Cliffe and Cliffe Woods". www.britishlistedbuildings.co.uk. Retrieved 26 November 2013. ↑ "Fenn Street Farm House, St Mary Hoo". www.britishlistedbuildings.co.uk. Retrieved 26 November 2013. ↑ "Isle of Grain Railways", Adrian Gray, Oakwood Press, 1974. 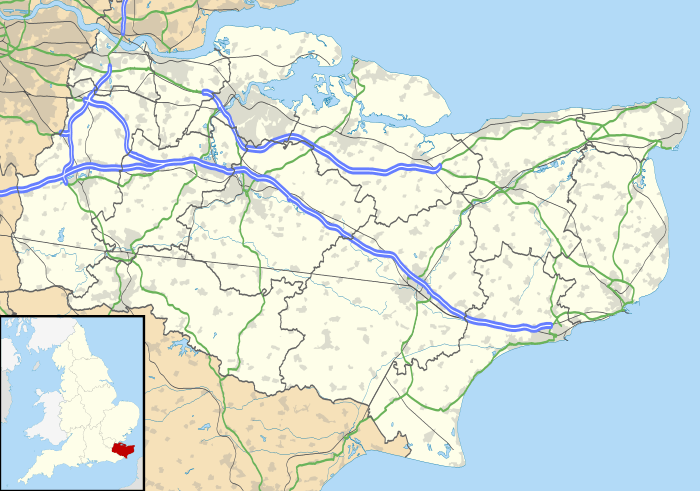 Wikimedia Commons has media related to Hoo Peninsula. EON press release On future plans for the Grain and Kingsnorth powerstations.